On February 1, 2018, the absolute best day of our life, Lucas Michael entered the world screaming, at 6 lbs 8oz. We knew Lucas would be born with complex heart defects and 22q deletion. There wasn’t a dry eye in the room as we witnessed a true warrior fight to breathe and immediately show us his strength. They took him straight to the adjacent operating room and placed an umbilical line for testing. He was then moved to the NICU to begin echos, ekgs, blood tests, and everything imaginable to begin the plan for his treatment. Luke then had a heart catheter at one week old where they were only able to get a stent to one of his lungs, and not the other. The catheter did not go as well as planned, but Luke continued to fight. He was doing really well when out of no where we noticed seizure like activity. We later learned he had a blood clot, likely from his stent, which caused him to have strokes, which caused the seizures. Now we had a whole new set of obstacles and medications. Luke spent his first 7 months on constant oxygen, anti seizure medication, blood thinning injections, and a couple others. He saw a cardiologist in Wichita and Kansas City along with a neurologist, hematologist, physical and occupational therapists. The plan at Children’s Mercy was to send us home so he can gain weight and then do 2-3 open heart surgeries this year to stabilize him. With the possibility of more soon after. We didn’t love this plan, 3 open heart surgeries before his first birthday, the thought made us nauseous. After some research, we found a surgeon who “pioneered” the surgery Luke needs. So we asked our cardiologist to send all of Luke’s information to this team at Stanford Children’s hospital for a second opinion. They contacted us and let us know that they would do Luke’s full repair in 1-2 surgeries, and showed they had full confidence. Without a second of hesitation we said yes and decided to move forward with the surgery at Stanford. 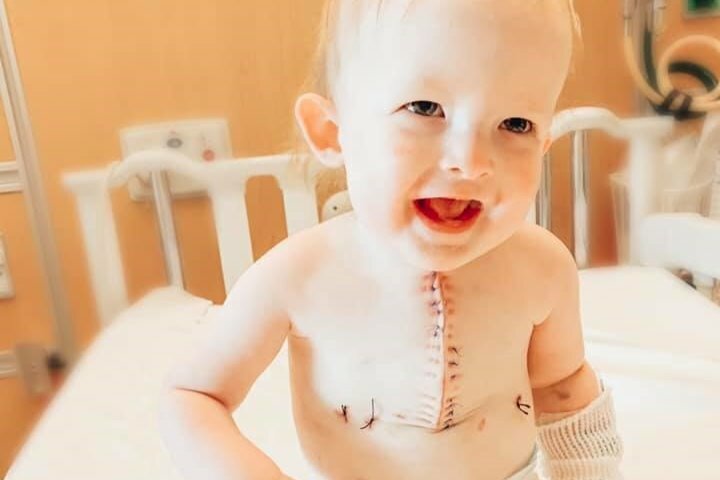 Lucas had his first open heart surgery on September 12, 2018 at Lucile Packard Childrens Hospital in Palo Alto, California. He did phenomenal with very little set backs in his recovery. The surgeon decided that Lucas would need 2 open heart surgeries, his first he would repair his right side (it was getting little to no blood flow), let the right side grow for 6 months and then we would return for his second open heart surgery in March of 2019 where he will (God willing) do a complete repair. We thoroughly enjoyed this in-between time of his surgeries, but there is always the next surgery looming over us. Lucas celebrated his first Thanksgiving, Christmas, and FIRST Birthday! He has been working hard at gaining weight, and in his therapy to be as strong as possible for his next big mountain he will climb on March 15, 2019. Summer 2018, I was riding my blue mountain bike across the country from Va-Or trying trying raise money for Mott Children's Hospital's congenital heart disease foundation. West of Wichita, on a stormy soaking Kansas night, I had multiple systems failure in my bike leaving me stuck in a little town I had not intended on staying in. After a restful sleep on top of a picnic table to avoid the flooding I went to the gas station to get some coffee and something to eat. As I sat drinking and eating a man came in and sat down with a coffee and after a few minutes we sparked up a conversation. After about a half hour I told him why I was riding cross country and he said he knows someone I had to meet. Jim told me to hop on my bike and follow him to a local cafe a few blocks away. Within just a couple minutes we arrive at the cafe where I met Andi and Amiee. Jim told them what I was up to and they were excited to hear what I was doing and eager to help me out. Everyone in the cafe showered me with blessings that morning. I left that cafe confused and in awe, these folks were managing a small town cafe struggling with their baby boy and his needs, yet they all rallied around me even though I did nothing directly for them or anyone really. I got a few miles down the road and Jim called saying he wanted to come get me and take me to a bike shop; get my bike fully serviced and take me to a hostel he found. I was dumbfounded and said, "yes," because I really could use the help, after he came and got me squared away and left me in the parking lot of the hostel he said friends for life and so did I then he drove away. I walked inside the empty church building and started crying. I was just so overwhelmed with the goodness in people, the willingness to pay it forward without asking or wanting anything in return. This experience left a lasting impression in my soul and I vowed to do whatever I knew I could to give back however I can in general, but also specifically for Lucas and the amazing family he has. It is my mission this summer to paddle across Lake Michigan on a stand up paddle board, I will dedicate myself to training for this from now until it is complete in August-September. Part of the process will be to document my training progress and physical adaptations through independent tests conducted by various people in the health professions. More of this process will be revealed as time progresses for now we will be testing the cardiovascular and metabolic systems keeping track of how they respond to the program utilizing cutting edge and also traditional methods of supporting the body. I am dedicating this project to Lucas Strong, I want to see this dude's family taken care of, they are out there taking care of strangers in their most dire times, there is no one more deserving that I know. Let’s rally together for these folks!